I’ve been fascinated by Anais Nin for years. I’ve always meant to read her diaries, but for some reason that’s never happened. When I saw Apprenticed To Venus as an option to review the ARC for I couldn’t help myself. This memoir is about the author Tristine whose godmother was a friend of Anais and asked Tristine to bring Anais something. This errand is what sprouted a friendship between Tristine and Anais. 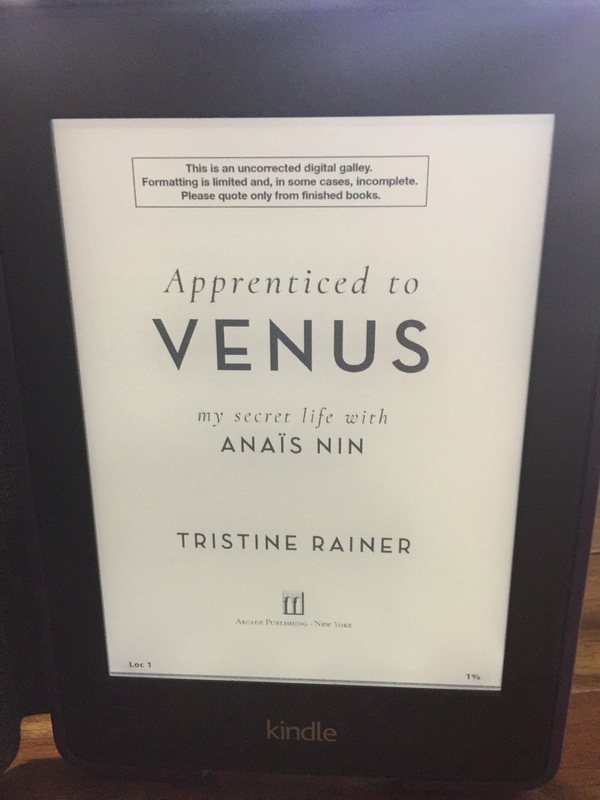 Tristine’s memoir is about her friendship with Anais and what it was like to be mentored by her. I was in awe of Anais. I thought she was sophisticated, pretty, elegant, sensual and quite the muse for a number of people. Once I read this book my opinion of Anais changed. She comes across as a manipulative opportunist. Then I got to thinking aren’t we all that way to some extent? Some of us are more obvious about it than others. Anais just peppered hers with flattery and support through offering her friendship. Tristine is enamored by Anais and yearns to be like her, to gain her approval. This brought to mind that we all have one person in our lives who we admire and want approval from. We spend our lives kowtowing to said individual and in the process we lose who we are. We are so caught up in wanting to be like this particular person our own sense of self goes right out the window. I, myself have had such a friend I was enamored with. I was so focused on getting her to like me, shower me with her praise that I ceased being me. Not until I backed away from this deep friendship did I start to rebuild who I was apart from her. It’s too, easy and convenient to fall back into the groupie mentality and not develop who are, so we can compliment the other person. This memoir explores this topic in-depth and shows how much of our life can be so wrapped up in another we lose who we are as an individual for years. Lost years we can’t get back. This book also, discussed that no matter how a close friend may wound you, you can still love them fiercely and not give up on their friendship. Tristine’s account is raw, moving and honest. Her account of Anais’ life is spellbounding. I know my thoughts about Anais fluctuated throughout the book. Just when you want to throw in the towel Anais pulls you back in to insist you still love her. If you are interested in Anais Nin I do recommend this book. It goes on sale this month on the 11th. I was provided the ARC care of NetGalley in exchange for my review. 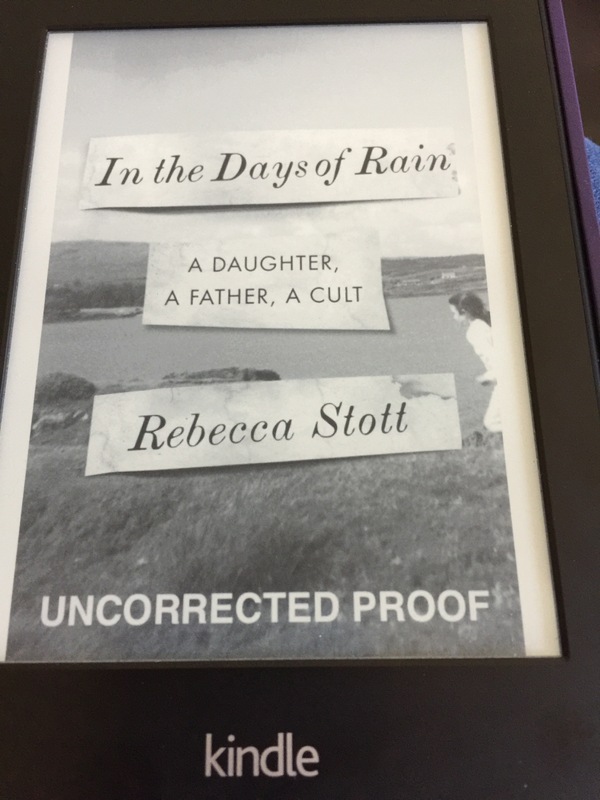 In The Days Of Rain, is about Rebecca Stott and how she pieces together her father’s life in the Brethren cult. Rebecca was raised from birth only knowing the Brethren’s rules and ways of life. Before her father passes on he asks her to complete his memoir. Having left the cult with her family when she was a child Rebecca isn’t keen on going down memory lane, but wants to fully share her father’s story no matter how hard it is. This memoir describes what life was like in the Brethren. Everything outside their close-knit group was forbidden: TV, news, worldly people, books that were not approved, movies, etc. As a child Rebecca was caught up in thinking about the Rapture when Jesus would be returning to take all the Brethren to Heaven. This book not only describes what life was like, but about how being in such a controlled spiritual environment fractured relationships and one’s sense of self. Her father was the head of the household and had a bad temper. Rebecca never understood why until she dug deeper into her father’s past and what being a preacher in the Brethren was like for him. Rebecca never knew what it was like to voice her own opinion growing up. Women were to keep quiet and not question anything. It took years for Rebecca to learn how to voice her own opinion and to patch up her relationship with her father. For some reason this topic fascinates me. I can see why cults lure people. People like having spiritual matters laid out in black and white. Being told what to believe, how to act, dress and think is easier than having to make your own decisions. A few years ago I experienced what might be termed as an online Christian cult of sorts. I was enthralled by a particular Christian YouTuber. I befriended this woman, but as soon as I started being honest about red flags I was seeing I got disfellowshipped and unfriended. That is unless I had a prayer request, then by all means it was ok to contact this woman. At the time I discovered and befriended this woman I was spiritually vulnerable and spiritually hungry, so of course I gobbled up what she said. I followed her hook line and sinker. Sadly she burnt me. I thought I had a genuine sister in Christ, but instead I got black listed by her. Sadly there are others out there that had the same thing happen to them. One minute you are a blessing from God and the next you are not a true saved follower of Jesus. I can see why Rebecca’s Faith didn’t survive her cult indoctrination. It’s sad her faith didn’t survive her upbringing, but I don’t blame her for guarding her heart. I received an ARC of In The Days Of Rain by Rebecca Stott for free from Blogging for Books in exchange for my honest review. If you’ve been raised in a cult this book may be too, much of a trigger, but it also, may help you sort through your own journey whether you are still inside the cult, or are free from it. I saw this title and couldn’t decide if I wanted to read it. I possibly didn’t read the fine print on what this book was about, but it was not what I had in mind. 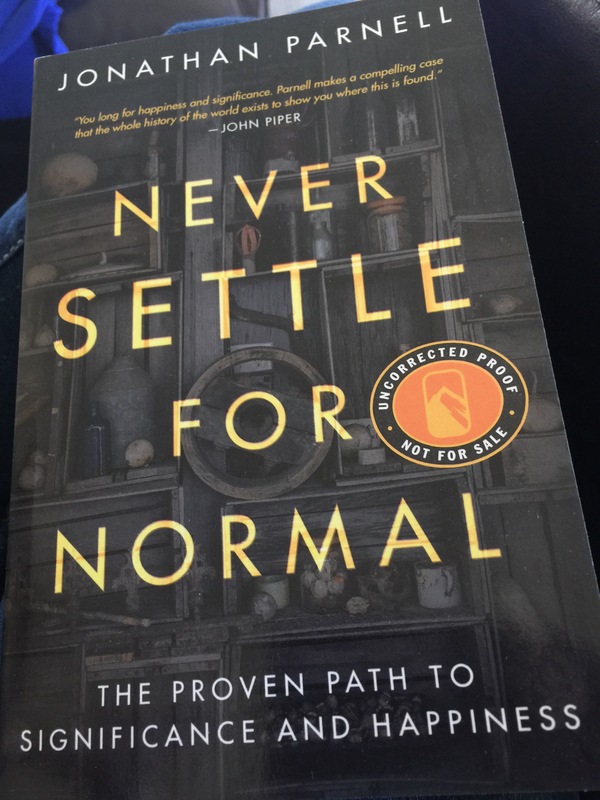 Never Settle For Normal by Jonathan Parnell is about how we try to fill our lives with the usual things we think that will make us happy: nice homes, fancy cars, high-end dining, promotions, vacations, lots of socializing, etc. These things for a time tide us over, but there is still something missing and gnawing at us. Mr. Parnell explains what’s causing the gnawing feeling deep in our souls which amounts to giving us a condensed Christianity 101 breakdown. Maybe I’m jaded, or have heard it too, many times, but if I was not raised a Christian with the basics taught I’d be lost reading this slim volume. There are a few big what I’d call Christianese words slipped in. If a non believer is reading this it might come across as Greek. Mr. Parnell means well and is offering to show there is more to life when you believe in Jesus. I honestly thought I was reading a book about not settling for the norm in life as in think outside the box for your life vs getting a Christianity 101 lesson. If you are looking for a book that breaks down what Christianity is you might find this book helpful. I received the ARC of Never Settle For Normal from Blogging for Books for free in exchange for my honest review. Sadly, this book didn’t quite hit my spot, but it might yours. It goes on sale July 18. Click here to find out more.